Ampang Jaya, 21st September 2007: Like a movie stuntman, a satay seller appears to be engulfed in flames. The picture is made more dramatic by using a wide lens from a low angle. Nur Satay at Restoran Studio 5 serves some of the best satay in town. Some believe that the popular dish was invented by Hainanese immigrants, many whom were cooks during the colonial days. 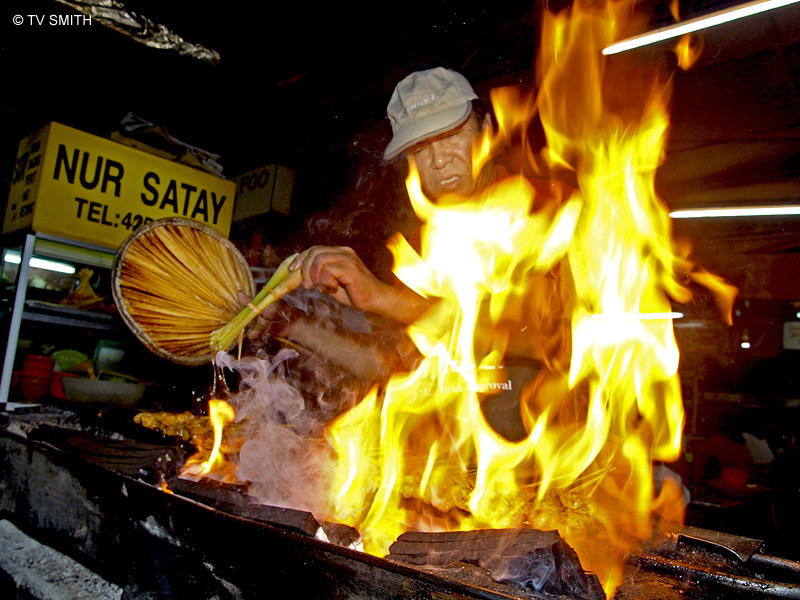 After learning about kebabs from their British employers, they fashioned a localised version named "Sar Tay" or "there pieces" in their dialect. Others believe it is an adaptation of kebabs introduced by Arab traders to the Javanese people during the 19th century, as it is also popular in Indonesia today.